“Kontroversial, Kool, Klever, Kookaburra never disappoint me with their sticks and the awesome Lbow range and the Team Phoenix hockey stick hits us again with it’s Kookaburra spirit. This Kookaburra model was the focus of some controversy back in 2011 when they exploited the FIH rules slightly with the shaft bow bending twice allowing an extremely low bow position. The Team Pheonix review here concentrates on the 2015 model that still has an extreme low bow position at 220mm up from the ground and is 24.5mm curved. This gives an extreme bow feel to the stick though is not the lowest around. Don’t get me wrong though, if you are searching for a well-balanced low bow stick and of the Lbow range from Kookaburra can work for you. 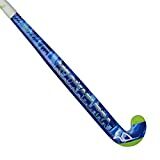 The Team Phoenix is an incredibly well priced top of the range hockey stick and the shaft bow is far from its only redeeming feature. Kookaburra champion the triple core system. Most other brands favor a dual core and Kookaburra insist this extra chamber adds to the strength of the stick. I certainly found that the Team Phoenix hits the ball hard so they might be right. Just to explain the core of the hockey stick I’ve added a graphic. If you cut the shaft of most sticks in half you will see the inside split in to chambers, dual core = 2 chambers and if you cut a Kookaburra Team Phoenix in half you’ll find 3 chambers. The chambers, cores, whatever you want to call them are filled with either resin or foam. “It’s a choice, I’m not sure if it’s the right one, to use fiberglass to top up the last 5% of the material composition in the Kookaburra Team Phoenix. Most high end sticks are manufactured to 90+% carbon fibre and the rest as aramid. This Kookaburra hockey sticks choice of fiberglass may explain why its up to 50% cheaper than the likes of the Grays Kinetic 12000 stick for example. For all except the absolute material purists this won’t be much of a problem in my opinion, the stick feels hard as nails and for me the balance of budget against aramid pays dividends. What Kookaburra has excluded in material for the Team Phoenix they have made up in more areas of hockey stick technology. The combination of Fabricated Carbon and Nano Composite technology, both of which aid the alignment and bonding of the fibre strands together for maximum strength, certainly help to make up for the lack of aramid. The Kookaburra Maxi shaped head also has a couple of great pieces of tech. The famous Kookaburra skill zone means there is a slight indent in the head for the ball to rest in. Then the KCF (not KFC) is a kind of textured area within this indent that grips the ball, not quite sandpaper but that theory. I actually play with a different model of stick from Kookaburra, the instinct, which also has this KCF texture and unlike the equivalent TK hockey stick technology actually last and works pretty well. With both these technology features in the head of the Team Phoenix it makes it easily the best feature of this stick for me to review as I enjoy sticks that are good to dribble with, and give control on the ball. Let’s throw CVT in as little inserts behind the handle and SFR (soft feel resin, all these acronyms are worse than the IT industry) which are both installed for shock absorbing from the impact with the ball and you’ve got a really great stick full of features. Warning to user, shock-absorbing features only work if you catch the ball right. “The new thing for 2015 is the technology for the backhand edge of the stick, watch out for it in the Team Phoenix and the other Kookaburra reviews of the Team range. The range has a reinforcement in the offside edge of the stick designed to both increase the durability and the impact on the ball if you hit the reverse shots on the edge. These things often are just noise, however I certainly noticed my miss hit reverse shots seemed nice a firm not the wet slaps I normally get. From when I was just a little boy I always thought the Kookaburra hockey stick was a cool looking tool. I must say the sticks look better up close than in the pictures, even if you take the pictures yourself. Over the last few years with Voodoo, Mazon, Malik and others trying to hit this cool style maybe Kookaburra now drops more in to the traditional styling category and I don’t mind this. When you are a bit more mature do you really want to be running around with some of the crazy designs available today? My one piece of advice is buy the version with the white handle, it looks great an contrasts nicely against the orange/red and blue strips on the stick. I also love the little blue Kookaburra on the front of the stick. Overall the review of the Kookaburra Team Phoenix is that this is a great stick. In that top of the range category with the big sticks you can pay twice as much for with awesome technology and features. Certainly a consideration for players wanting to combine dribbling and control skills with a low bow for powerful flicking ability. Think carefully about this stick before buying another that will cost you much more and may not give you much more benefit.